Rabbi Yisrael Pinson, is the Director of the Daniel B. Sobel Friendship House - a rabbi and spiritual mentor to the Jewish recovery community of Metropolitan Detroit. Since joining the Friendship Circle in May 2002 he has galvanized the outreach efforts of the Friendship House by becoming the spiritual mentor of the more than 400 addicts and their families who seek spirituality and support from the organization. Rabbi Pinson received his high school and college-level education at several intensive private schools the world over, including the distinguished Machon LeSmicha Center for Ordination in Melbourne, Australia. 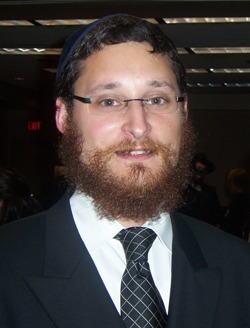 Rabbi Pinson has served communities and individuals from the Caribbean to Canada and is fluent in four languages. Rabbi Yisrael Pinson has helped create a Jewish Recovery Community in Metro-Detroit where recovering addicts and their families are helped through support, guidance, friendship & community. Rabbi Yisrael facilitates Jewish Recovery meetings, where recovering addicts from all 12-step programs meet and share regularly. He also teaches classes on Judaism & Recovery. For more information and to contact Rabbi Pinson click here. To read articles by Rabbi Pinson, click here.